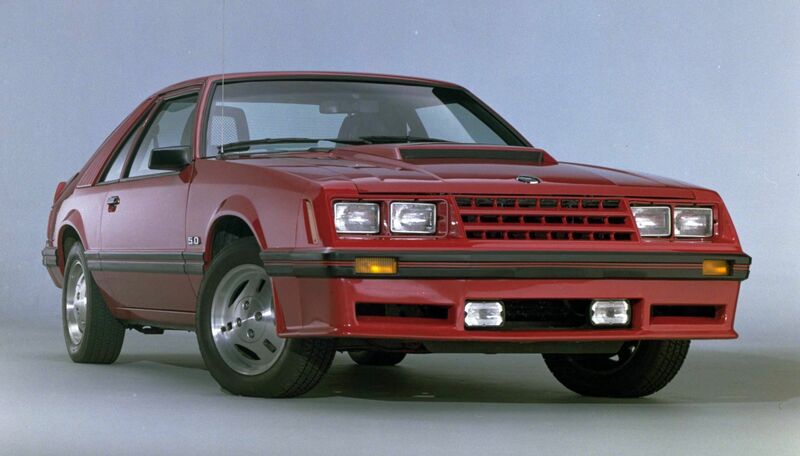 Appearing in September 1978, the Fox body Mustang represented a radical departure from the outgoing Mustang II, both atop and beneath the skin. This third-generation platform would soldier on for the next 14 years, becoming a popular and beloved Mustang variant with tuners, racers, and consumers alike. At Carlisle’s 2019 Ford Nationals, taking place on May 31-June 2 at the fairgrounds in Carlisle, Pennsylvania, “Foxes in the Barn” will celebrate the 40th anniversary of the Fox body Mustang, as well as its other Fox platform stablemates. Ford’s 1980 press photos included this image of a convertible, which wouldn’t appear until the 1983 model year. Work on what would become the Fox platform began even before the launch of the Mustang II for the 1974 model year. Looking to streamline production (and hence, cut costs) in factories across the globe, Ford’s goal was to create a common platform capable of underpinning a variety of vehicles, from sports cars to sedans, equipped with a range of powertrains. The first Fox platform vehicles – the Ford Fairmont and the Mercury Zephyr – arrived in United States dealerships for the 1978 model year, with the Fox body Mustang following one year later. The third-generation Mustang may have carried a similar squared-off appearance to the Fairmont and Zephyr, too, had it not been for the return of designer Jack Telnack to Ford North America. Fresh from a stint in Europe, Telnack brought with him Continental design sensibilities that helped to refine the Fox body Mustang’s shape. Its low beltline gave it something of a Euro look, while its angled nose and raked windshield helped to reduce drag – and hence, enhance fuel economy. When the third-generation Mustang debuted in 1979, the coefficient of drag was just 0.44 for the fastback and 0.46 for the notchback, making it among the most streamlined designs of its day. The 1983 Mustang convertible was the model’s first ragtop since 1973. 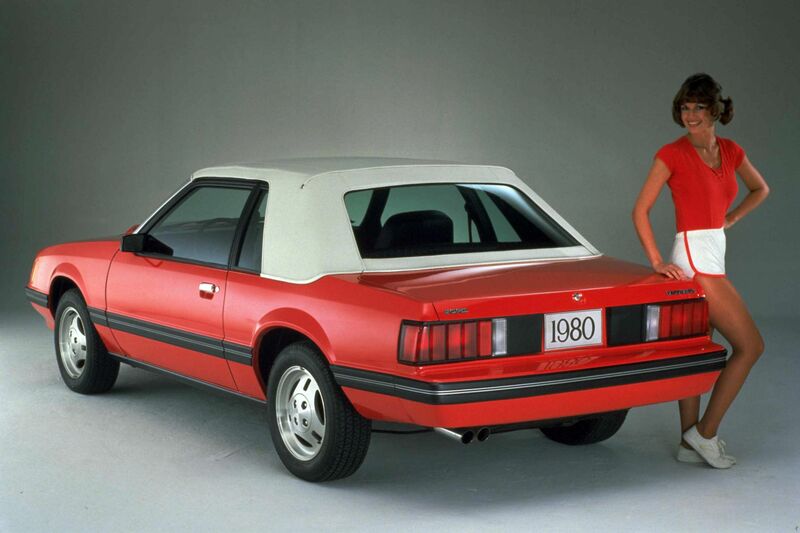 Compared to the outgoing Mustang II, the Fox Mustang rode on a longer wheelbase – stretched from 96.2 inches to 100.4 inches – and measured 179.1 inches in length, 4.1 inches more than the car it replaced. Inside, this translated to a claimed 20-perecent increase in interior space, yet changes in material and construction meant that the new Mustang still weighed roughly 200 pounds less than its predecessor. 1986 Mustang notchback (coupe, according to Ford). 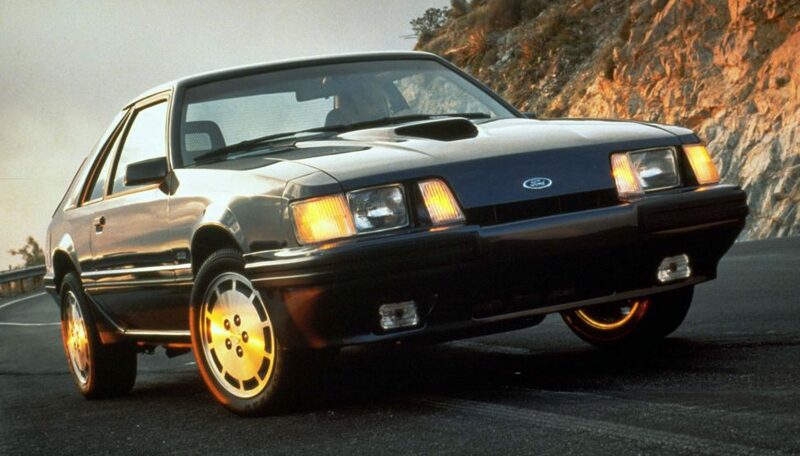 Under the skin, the Fox body Mustang received a new MacPherson strut front suspension, combined with a new four-link rear suspension that retained the traditional live axle, but did away with leaf springs in favor of coil springs. Engine choices mostly carried over from the Mustang II, including the 2.3-liter four-cylinder (rated at 88 horsepower), the 2.8-liter “Cologne” V-6 (rated at 90 horsepower) and the 5.0-liter V-8 (rated at 140 horsepower, one more than the Mustang II), but two other choices joined the lineup by midyear. 1986 Ford SVO, built for those wanting the feel of a European sports car with a domestic badge. The redesign proved beneficial to Mustang sales. By 1977, its penultimate year on the market, the Mustang II had dropped to 153,173 units sold, and in 1978, the car’s final year, sales climbed to 192,410 units, perhaps based upon the unknowns surrounding the third-generation Mustang. In 1979, the Fox body’s first year on the market, sales reached 369,936 units, exceeding Ford’s own projections of 330,000 units. Its selection as the pace car for the 63rd Indianapolis 500 certainly helped its popularity, as did the broad range of Mustangs available, from the affordable base model to the performance-themed Cobra, which came standard with the forced-induction four (but could still be ordered with the V-8). 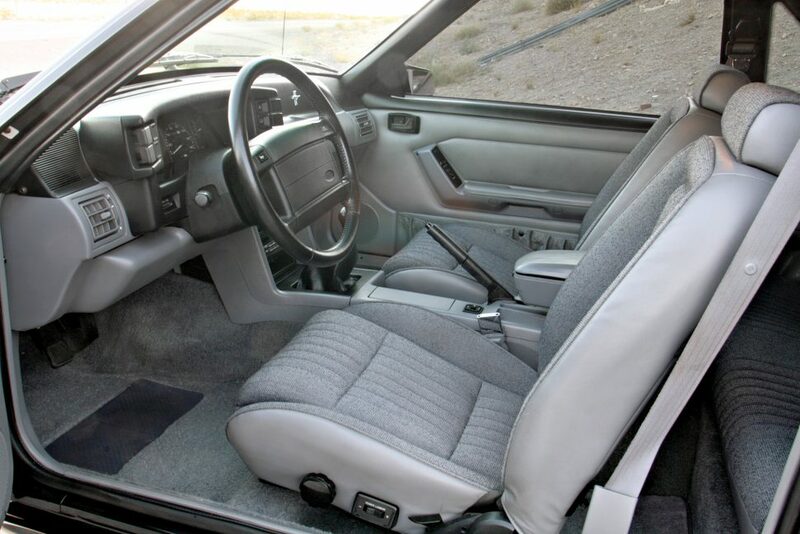 The 1987 Mustang received the first significant restyling since the Fox body launch in 1979. 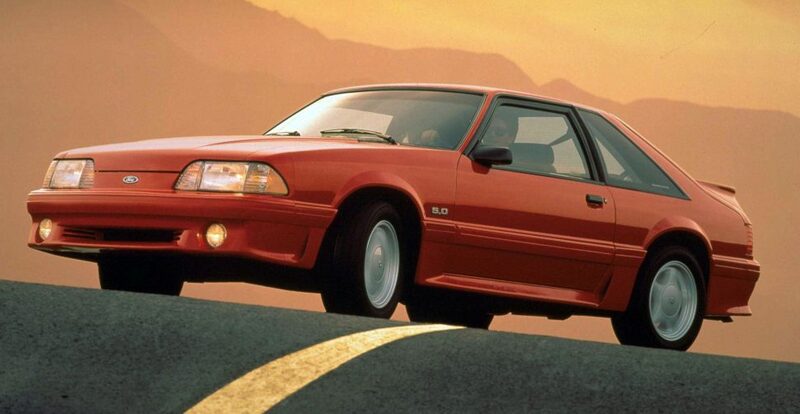 For performance-hungry Mustang shoppers, the Fox body’s sophomore year was a disappointment. To reach CAFE targets, Ford dropped the 5.0-liter V-8 from the Mustang’s 1980 lineup, offering the 4.2-liter V-8 (with its ground-shaking 119 horsepower output) in its place. The 2.3-liter turbo engine carried over as the performance option, but buyers were wary of this “new” technology and the problems associated with it. Complaints ranged from turbo lag to premature turbocharger failure resulting from insufficient lubrication to the compressor. The idea of letting a turbocharged engine cool at idle before shutting off was foreign to U.S. buyers, and perhaps even to Ford dealers selling the cars. 1988 Ford Mustang 5.0-liter V-8, rated at 225 hp. Photo by Terry McGean. In 1981, the turbo four was pulled from the car’s lineup, leaving buyers to choose from the normally aspirated four, the 3.3-liter inline six or the 4.2-liter V-8, which had dropped in rated output to 115 hp. A stalled U.S. economy didn’t help sales, either, and in 1981 Ford sold just 182,552 Mustangs, less than half the quantity it moved in the third-gen car’s first year on the market. The big news for 1982 was the introduction of the GT, which replaced the Cobra as the top performance model in the lineup and came with a 5.0-liter, high-output V-8 rated at 157 hp. Despite this, the year brought more bad news for Ford, as just 130,418 Mustangs went home with buyers in 1982. 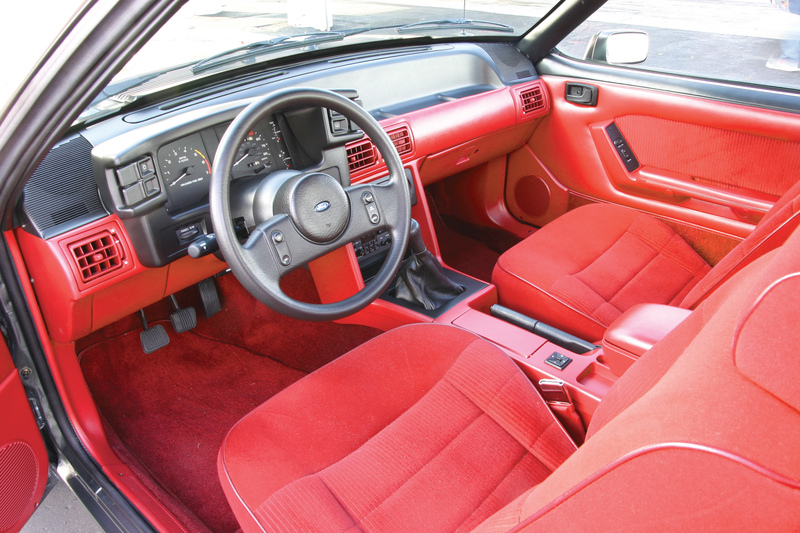 1987 Mustang LX interior. Photo by Terry McGean. 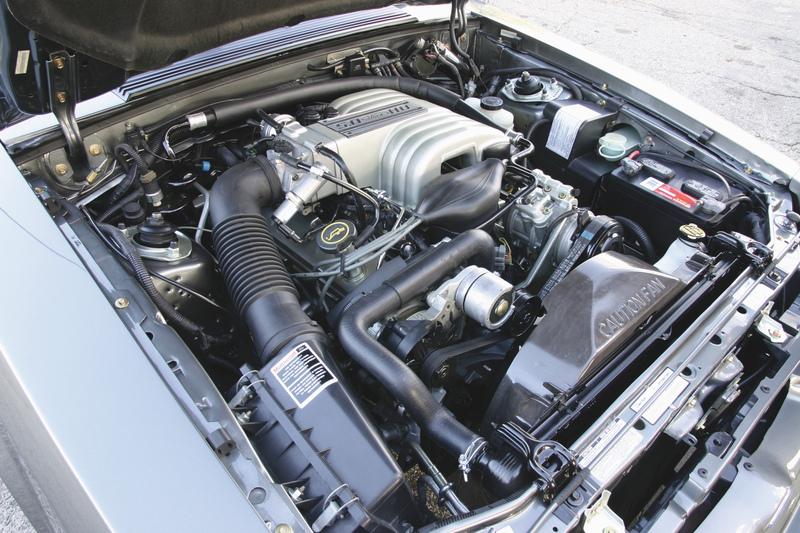 For 1983, the big news was twofold: First, a convertible version of the Mustang hit the market for the first time since 1973, and second, the high-output 5.0-liter V-8 received a four-barrel Holley carburetor, bumping output to 175 hp. Mustang convertibles – built by Cars & Concepts in Brighton, Michigan – proved to be popular with buyers, who purchased 23,438 examples, the highest number of Mustang convertibles sold since 1968. For those seeking performance with less weight over the front wheels, an improved, turbocharged 2.3-liter four, rated at 145 hp, returned to the mix. Ford was doing what it could to lure prospective buyers, but overall sales fell even further, to 120,873 units, marking the then-lowest point in the model’s history. The Fox body Mustang’s sales turnaround began in 1984, aided by a dizzying array of models on the showroom floor. Not counting trim levels, buyers could choose from one of six different engines, including the 88-hp, 2.3-liter four; the 120-hp, 3.8-liter V-6; the 145-hp, turbocharged 2.3-liter four (available in Turbo GT models); the 165-hp, CFI 5.0-liter H.O. V-8 (standard with the automatic transmission GT); the 175-hp, turbocharged and intercooled 2.3-liter four (available in the Mustang SVO); and the 175-hp, high-output 5.0-liter V-8. One special model, available only in GT trim, commemorated the Mustang’s 20th anniversary, and over the course of the model year, Mustang sales climbed to 141,480 units. 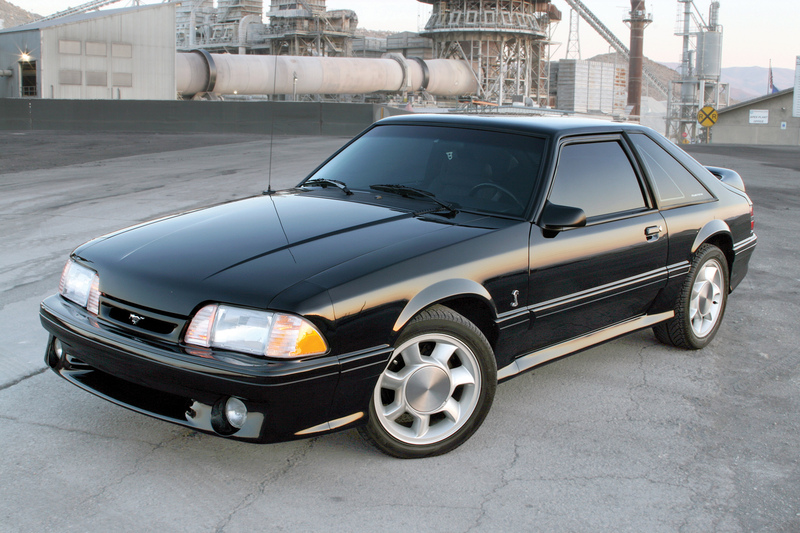 1993 Ford Mustang GT, the Fox body’s final year. Ford consolidated Mustang offerings for 1985, dropping the unpopular Turbo GT. The 5.0-liter high-output V-8, available only with a manual transmission, increased to 210 hp, and the four-cylinder turbo SVO model climbed to 205 hp. Sales grew to 156,514 units, and in 1986, climbed again to 224,410 units, despite few changes across the model lineup. The 1986 high-output 5.0-liter engine received sequential-port electronic fuel injection, as well as a true dual exhaust (instead of a single catalyst feeding two mufflers and exhausts), but a change in heads for emission purposes lowered output to an even 200 hp. 1993 SVT Cobra. Photo by Jeff Koch. The 1987 model year brought with it a significant restyling, as well as a shuffling of the model lineup. Gone were the SVO and the V-6, leaving just the 2.3-liter four (now fuel injected and rated at 90 hp) and the 5.0-liter V-8, producing an enthusiast-satisfying 225 hp with either a manual or automatic transmission. The reduction in offerings was, perhaps, the beginning of Ford’s long-term strategy to do away with the Mustang and replace it with a fuel-efficient front-wheel drive coupe (which would debut in 1989 as the Probe), and sales fell to 159,145 cars. They’d rebound again in 1988, reaching 211,225 Mustangs sold, the high point for the remainder of the Fox body years. 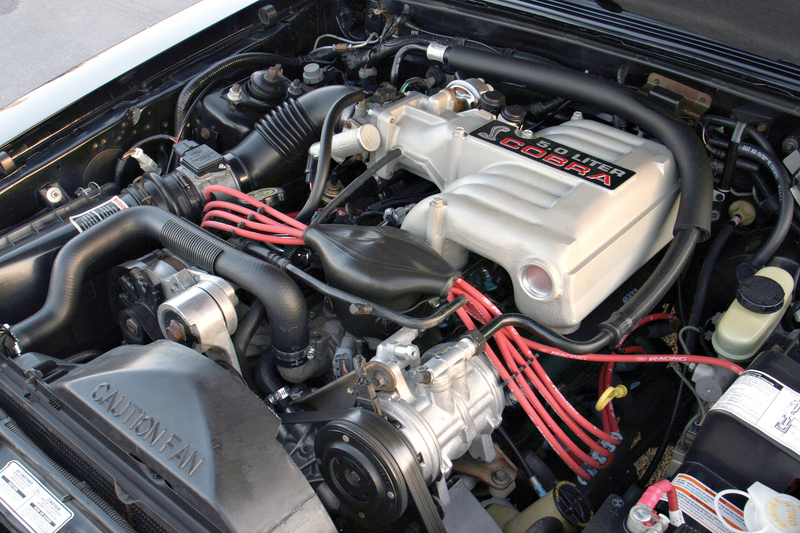 The SVT Cobra’s 5.0-liter V-8 was rated at 235 hp. Photo by Jeff Koch. Ultimately, the Mustang wasn’t eliminated, thanks largely to an outpouring of support from model fans. The Fox body Mustang soldiered on with few major changes through the 1993 model year, and as a send-off to its longest-produced version, Ford’s Special Vehicle Team (SVT) created a fitting high-performance model: the 1993 Mustang SVT Cobra. With a unique V-8 rated at 235 horsepower, four-wheel disc brakes, a revised suspension, and turbine-style wheels shod with 245/45ZR-17 tires, the SVT Cobra was the highest-performance Fox body Mustang ever offered by Ford – at least until the track-focused Cobra R (with less content for lighter weight, bigger brakes and adjustable dampers) was announced. The fourth-generation Mustang (often referred to as the SN-95) arrived for the 1994 model year, built atop the Fox-4 platform. Ford wasted no time in highlighting the difference between the third- and fourth-generation cars, pointing out that 1,330 of the 1,850 parts needed to build the SN-95 were new. Still, the fourth-generation cars retained their ties to the Fox platform, which further underpinned Ford’s Thunderbird, LTD, Granada, and Fairmont; Mercury’s Zephyr, Capri, and Marquis; and Lincoln’s Continental and Mark VII models of the period. Foxes in the Barn may be centered around the third-generation Mustang, but it will recognize all the car’s Fox platform siblings, too. For additional information on the 2019 Carlisle Ford Nationals, visit CarlisleEvents.com.